So on Friday night, we were invited by 2 of our work colleagues to go for some ‘Western Food’ and some KTV. (Karaoke) KTV is so popular here. There are tv channels dedicated to singing competitions. I even saw The Voice of China. It was so nice of them to bring us out! First a glass of water arrived for us. Then our dessert. DESSERT. Ice-cream with chocolate on top! Once we finished our chips and dessert, our meal arrived. It consisted with processed beef that was squished flat. Beside the beef were noodles, a few pieces of cucumber, and a single fried egg. Our sauce consisted of, from what I gathered pepper sauce, but it didn’t have much flavour. So that was our ‘Western’ food. It was so strange! It was mixture of Chinese, with the noodles, and their interpretation of what a Western style dish would be. I ate it all only because I was hungry, and I didn’t want to disrespect our colleagues as they invited us. It was also funny to watch the Chinese try and eat with a knife and fork, as they are so used to eating chopsticks. So after our meal, we headed to KTV. I thought it would be a little dingy place, but oh my god was I in for a surprise. It was so fancy! Inside the building was all marbled, with a long desk where you can buy drink, food and popcorn for when you are singing. There was a huge staircase where they took us to our own separate sound proofed room. There was a lovely leather sofa, a chandelier, a huge TV, and we even had our own bathroom! I couldn’t get over how nice and professional it was. Then I realised that KTV is actually a big thing for them, and it showed. The car park was full up with cars. At first I was a bit apprehensive about singing. Our colleagues; a teacher in the school and her husband and child, with my teaching assistant all got ready to start singing and pouring beers for us. But after a while I was fine, belting out tunes with my room-mate. We were there until half 12am! We had a great night and we thanked them, they promised they would bring us to a Chinese restaurant next time which I will look forward to! 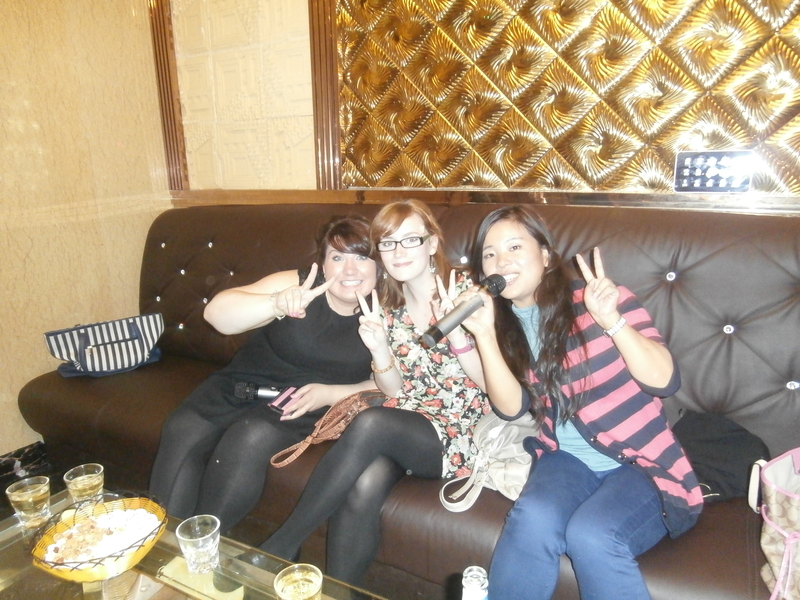 Us at the famous KTV! On Saturday, myself, my room mate, and 3 Chinese friends went to the shopping area of Chengdu. We had some messages to do and I had to try and get my Hard Drive fixed ( My friend came back from the computer shop and said ‘it is destroyed’ . So its definitley broken now. ) We went for some food in Pizza Hut, and then we went to a big indoor market. It was kind of like the Silk Market in Beijing, but this once wasn’t as nice as Beijing. Although the prices were so much cheaper! I got a pair of shoes for 69yuan. About 10euro. And it was huge! I’ll definitely be going back there! Then we went to a supermarket, where we ended up sitting for an hour drinking different Chinese teas. They are actually really nice, so I bought a packet for home and me and my room-mate bought a big packet of Jasmine tea. I will have to look out for it at home. Sunday was work day. Although I only had one class, I still hate the fact we have to work weekends to make up for national days off. We were sprung by a group of Chinese people about a meeting at 7pm, so we had to rush to that. It ended up having me and Charlotte go into 20 classrooms where students were studying, and saying ‘My name is Aisling, and I’m from Ireland’ 20 times. We were unknowingly promoting our English clubs that will be starting the week after next. So later on today I’m heading to meet a couple of friends at the train station where we will head to Xian and Juizhaigou National Park for our week off. Most of the group from the programme are heading to Shanghai, but I’d rather do more sightseeing. Lets bring on the Terracotta Warriors! Why am I so busy???! Why am I so busy?!? I don’t seem to have time for anything lately! Lesson Plans, teaching…and more lessons plans are taking over my life. I hope once I get into the hang of making lesson plans I won’t take as long as I do on them… it is hard though, trying to think of things to do for 90 minutes. And things that are actually interesting and fun for the students! I’ve also had a busy few weekends too. The weekend before last, myself and a group decided to hit the Biggest Building in The World. Literally. It’s called the New Century Global Centre and it was huge. It has only opened in August so its brand new, with numerous restaurants, 2 hotels, a cinema, loads of clothes shops, an ice-skating rink… and the infamous indoor beach! It really did feel like you were standing in a beach… and the water was lovely and warm. The only downside was that we had to wear a life-jacket….in 3 feet of water. So there was no actual swimming involved, more like trashing about like a beached whale. Buy it was enjoyable all the same. We then hit the slides which were amazing, then lazed about in the Lazy Pool. But of course, as usual, there were stares. 9 Western girls in bikinis walking around China is bound to draw attention. But we carried on and just tried to ignore them as much as we could! But one thing I did notice though, was how quiet it was! Now this was a Saturday, so we were expecting the worse. But it was actually too quiet. I have no idea why this is. Maybe not a lot of Chinese people know about it? Or they may not be able to afford it? From what I gather they are trying to entice more Westerners to it. So the next weekend, myself and 3 others organised a little trip because it was the Moon festival. We had Thurs, Fri and Saturday off (we had to work Sunday to make up a day) so we decided to go to Mount Emei and Leshan to see the Giant Buddha. We arrived in Mount Emei and we stayed in the ‘Teddy Bear Hotel’… yes that’s the name of it… It was actually not a bad place, where they played English films on a big projector screen! It was great, us relaxing on comfy sofas; eating our hamburgers and drinking coke. The only negative thing was the damp in the room and beds. We only stayed there 2 nights though so we could stick it out! After that we went for ANOTHER walk… aka hike. I can’t remember the name of the park but it was a nice area, with temples in it and monkeys; who peed on my friend. She thought it was rain coming from the tree. The day after, we travelled to Leshan and went to see the Man himself. . . the Giant Buddha. It was really good! The Buddha is massive, and it overlooks a big river. I also thought the Buddha would have been located in the middle of a mountain or forest, but no… it sits looking out on a river, which people can go on a boat and see it from there. Our tour guide (an accounting teacher looking to practice her English) told us that the people who made it put grooves in his head so the water will run away from his face and down his ears instead. This was so he wouldn’t erode from the rain. In total it took 90 years to construct. The man who conceived the idea died before it was actually finished. So my next adventure is hopefully going to be Xian and Juizhaigou. We have a week off at the beginning of October so a lot of people will be travelling around then, including most Chinese! We are having trouble booking tickets though. We thought we needed to book train tickets 10 days in advance, until we went to the desk and found out there were only standing tickets… for 15 hours in a train. We were told that its actually 20 days in advance! The Director of our Uni treated us to supper today. Sally ( our Advisor) came running up to us and said ‘Our Director wants to take you out for dinner’…. Now the Director is busy, and I mean really busy man, but I thought it was lovely of him to take time out of his heavy schedule to bring us to dinner. Dinner was actually funny! The Director, or his English name Thompson, has very little English, but he sometimes tries to say some English to us. Sally, who is practically fluent in English had to translate to him what we said. He got us all a bottle of beer… then later, he asked us do we like wine… Charlotte answered ‘Yes, I like red wine’ while I said I prefer white. He then said ‘I like white wine…I go get you white wine in car’. So off he went to get us some wine, us shocked at his kindness. So he reappears with wine… but not white wine….. no, he appeared with RICE wine. Two small bottles of Rice wine for the both of us. Rice wine is kind of like Vodka.. it is about 45% volume but can go even higher. So there we were, with chicken feet and fish in front of us, Thompson waiting for us to take a slug of this Rice Wine. You have to take Rice wine as a shot, but Charlotte asked could we have juice with it; to lessen the blow. So we poured the juice into the small glass and topped it up with the wine. Thompson looked HORRIFIED. We had to try and explain to him that we couldn’t drink it straight, we needed to mix it. I think he presumed we would take a drink of the wine, then a drink of the juice. The wine didn’t actually taste that bad, once the juice was added. We’ll know for next time when we go out with him, which it appears to be sometime next week, not to mix juice with our wine. We got to keep the wine aswell… along with the left over chicken feet and fish…. In other news, class went well today. I only had one, and only 8 girls showed up, but I had a great class with them. Since its only the first week, I don’t think half the students know their timetables, mine is changing again next week! I showed them pictures of my family and I showed them a video of myself when I was a child with blonde hair. They said the blonde hair was lovely and they wished they could have blonde hair. One girl kept calling me ‘Teacher’ so I had to say to her she can call me by my name , that that’s ok.
Last night I had 30 boys in the class, no girls. It strange to see how the boys and girls act differently. The boys try and act like the cool dudes, giving smart answers back. One student said that being ‘Handsome’ was a skill. The girls on the other hand are a lot more eager to learn more about Ireland and myself, so I had a great class explaining to them about Ireland and the differences between Ireland and China. They were even helping me with my Chinese. My first Chinese phrase I know is ‘I want to take-away’…. Ironic its related to food of all things. I went to my local place for food, my favourite place in the area, and although they laughed when I said it in Chinese, they actually understood me, and I think they actually were happy that I could say it to them. They put their thumbs up when I said it so that’s a plus! I have a busy timetable next week, I have two 7pm classes. Its mad to think they are at school from 8:30am to 8:35pm… I don’t know how they do it, here’s me crying when I had College until 5pm. Had my first lesson today! Finally after a week of doing nothing since I arrived, it was good to actually start doing what I was meant to be here for. The class was 90 minutes long. 45 minutes, 5 min break, then another 45 minutes. It was quite daunting, trying to think of things to do in those minutes. I was teaching an elective group, who were studying Automotive Engineering, aged 17-19 years. They are apparently really clever, it’s just their English isn’t great. Although I started teaching.. . my god was it challenging. My group just wouldn’t answer my questions. It was like trying to get blood out of a stone. I quickly realised who was the best at English, firing questions at me. What made it worst though, I can’t actually understand the students. They say something to me and I have to ask them 3 times to repeat it. I just can’t understand them. Hopefully after a few more classes I will be able to catch a few phrases. I also have a teaching assistant. .. I never saw the day where I would have an assistant. They got the power point ready for me, had a copy of my information, and they also brought a ball for me to use in the class. I was even asked do I want them to actually MAKE my power point before class! How mad is that? Their main job however is to translate to the students what I’ve just said. It kind of defeats the purpose though in my opinion. . . but apparently its necessary because they are really bad at English. Even their teachers (who aren’t great at English themselves) state they are ‘not very good’. My teaching assistant for that group is called Liang, he is so funny and nice. He only had to interpret what I said once to the group which was good. My next class is tomorrow at 3:15. My latest class runs from 7pm to 8:35pm at night! 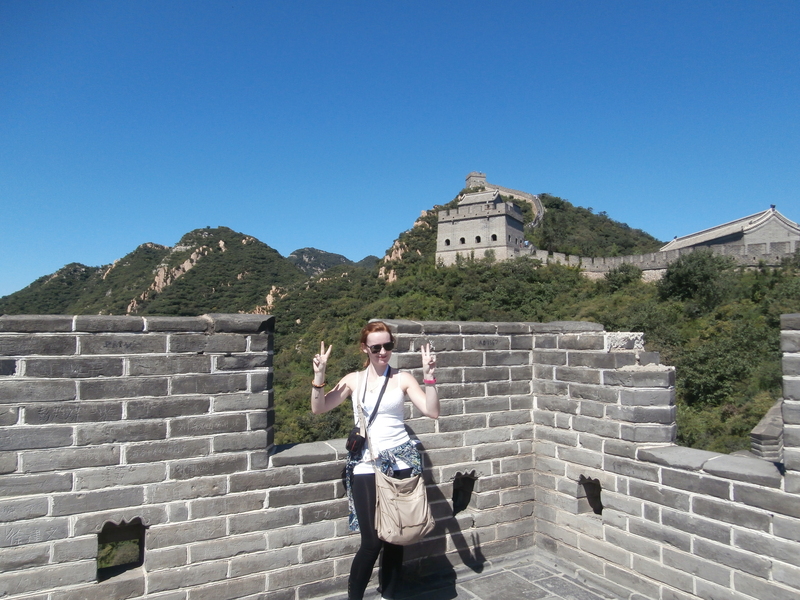 I also forgot to mention my Great Wall experience. It was AMAZING. We had brilliant weather too, so we could see for miles in any direction. It was such an experience I will never forget. I actually made it to the top of our section… it was STEEP. I couldn’t get over how steep it was. My legs were aching by the time I reached the top, but I was so pleased with myself. I was ready to quit near the top, but I said to myself ‘when will I ever get to do this again?’ So I pushed on and made it! I will never ever forget it. After the Wall, we went for dinner, then went to see the Birds Nest. We didn’t have a lot of time because we left late from the campus (nothing is ever on time in China) so we just got to go up on a bridge and look at it from there. We then headed to Tiananmen Square for a nosy. Nothing exciting was happening there. After that we got food…aka Peking Duck. I enjoyed it but with a large table of about 10 people, there wasn’t much left after the Lazy Susan got to everyone. A Lazy Susan is a turntable in the middle of the table which spins. The food sits on top so everyone shares from the same dishes. Later we headed to the Acrobatics show. It was really good. There were girls spinning plates, balancing umbrellas, men throwing hats… I assure it was a lot better than what I described! All this happened the day before I left for Chengdu, so it was nice to be with the group one last time. I went out last Friday night and met up with the Chengdu crowd. I have never seen half of them before because A. I just never got to talk to them before, or B. they were with the Love Tefl group. I actually had a great night, just would have been nice if some of my friends whom I met on the course were there. And it’s ‘Teachers Day’ tomorrow. I’m not going to be expecting much, or anything for that matter from the students. An answer to a question would be nice though. I’ve only been here a couple of weeks, but already I’ve noticed a fair few differences between China and Ireland. From the places I’ve been to in China, being Beijing, Harbin and Chengdu, I’m pretty sure 4 out of 5 cars are insanely nice cars. I’m talking Porches, BMW’s, Audi’s, Mercedes, Passat’s here. They are kept immaculately clean, with hardly any scrapes and bumps (with the way Chinese people drive I’m shocked they don’t have any). This was one thing I was surprised about. I hear cars are cheap here, but literally every person, bar taxi drivers, have gorgeous cars. People like to beep their horns… all day every day. Whether it’s to beep at a person crossing the road even when the green man is lit, to beeping in traffic a mile long and literally at a standstill. My teaching group came to understand our bus driver’s beeps; quick beeps to warn a car in front that they are passing so the car won’t swerve in front: Chinese people don’t know they have wing mirrors. Then there are the loud, long and abusive beeps, where the bus driver is in a foul mood and wants everybody in the vicinity to make way for him. I’ve often heard on other blogs that it’s hard to cross a road. They are right. It’s almost impossible! Even when the Green light in on, cars come veering out of nowhere and literally would plow into you if you don’t move out of their way. It doesn’t matter if the light is on for pedestrians, the cars rule the roads here and they make sure you know that! I am going to become so tight with money when I go home. Everything is so cheap! A large bottle of beer is about 80cent, while a huge plate of rice, meat and veg is about 1 euro. From what I see, shampoo and conditioner are quite dear, with the likes of Starbucks and Costa have Western prices. What is dear however are nightclubs. Drinks are ridiculous, with one cocktail being about 80yuan, about 8-10euro. Girls are free in though! All I can say is; Rock Hard. Now I don’t mind hard beds, I’d rather a hard bed than a real soft one, but these are like sleeping on wood. Only a real thin blanket separates me from the base of my bed. I’ve noticed this with all 4 beds I’ve stayed in so far in China so it must be a universal thing. The weather fluctuates so much here. The first day I arrived in Beijing the weather was glorious. Clear blue skies and about 35 degrees. Then the next day it was so hazy, most likely due to the pollution. Up North in Harbin, the weather was cooler, one day it would be sunny, the next raining. In Chengdu, it’s mostly cloudy all the time. In the winter though it shouldn’t fall below zero which is good. The people are so friendly and helpful. They are quite reserved people, but they would help you with simple things, like helping you with your bags ( when I arrived in our hostel in Beijing, a group of employees came and took our suitcases into the hostel) to even helping to bring drinks outside. They are eager to help which is lovely to see. Even the older generation are lovely! Everywhere I went, apartments and buildings were being built. Like I mean everywhere! Passing in the train, we saw endless amounts of large apartments being built in desolate areas. It was really sad to see because to me it seems like they are ruining their landscape without caring. Every city I’ve been to there were loads of buildings under construction. Not only that, they are building them in mass. Not one at a time, 10 skyscraper apartments all at one. It’s sad. I’ve noticed a lot of students hold hands. Well I’m meaning the girls from 17 onwards. They link arms and hold hands when walking together. It’s nice to see and they seem comfortable with each other! When we were lost in Harbin, we asked some people for a specific place. Blabbering on they went, talking in Mandarin to us. It really seemed as if they thought once we said Ni Hao to them, they automatically thought we could speak Mandarin. But the people do try to be helpful, most of the time anyway! Some people would ignore you if they thought we wanted help, this happened to us in the subway. A man turned his head away in a ‘I don’t want to talk to you’ kind of way. We found our way back though, no thanks to him! The amount of dogs I seen here is crazy. And I’m not talking about the ones they eat. I mean small dogs like little toy dogs. They are adorable. I have only seen 1 big dog since I arrived, it being an Alaskin dog. They love their small dogs. I suppose they are easier to care for and are better suited to apartments. Will post more differences when I can! After a 28 hour train journey, I finally made it to Chengdu! My group took the longest to reach our placement, with many travelling to the South taking just 20 hours. I have no idea how we took so long! We left Beijing on the Sunday and arrived the next day at 4pm, where our school advisors picked us up from the train station. The scene actually reminded me of the film ‘Empire of the Sun’ where the little boy (Christian Bale) was reunited with his Mum and Dad at the end of the film. All of us interns wandering around the crowd of people looking for our advisors. I didn’t even have time to say goodbye to any of the other interns because we were whisked away, all of us starting a new life in a different part of Chengdu! So a little about my placement; well it is HUGE. It is called ‘Chengdu Aeronautic Vocational and Technical College’ where they study aviation, flight stewarding, aviation engineering, marketing, among more. There are about 12,000 students studying here, and it has 2 supermarkets, hairdressers, a big stadium, 2 canteens and shops for stationary, electronics and the like. It’s only a couple of years old, and they are building a new building at the moment. They even have a plane replica where the flight attendants train. Our apartment even has an actual plane sitting outside it! Not sure of the exact kind but it looks like a fighter plane? It is about an hour out of Chengdu city, which is quite close by China standards. Our apartment is actually lovely too. Brand new fridge, washing machine and flat screen tv. (Although there are no English stations) There are two separate bedrooms with double beds and a bathroom. Apparently we are staying in the ‘teachers dorm’. I feel so privileged! I also tasted the famous ‘Hot Pot’. My advisor called Sally brought us to the most famous Hot Pot restaurant in Chengdu apparently. The restaurant was gorgeous. The food however was a bit strange! Cow stomach, barely cooked pork and some kind of small ink fish was what we were faced with. I actually ate the fish which I was surprised about, but I left the cow stomach. I was delighted to see potatoes arrive, but the slices were still kind of raw…They even eat potatoes differently! Today we had to meet with a couple of our assistant teachers where they told us I would be teaching a class to flight stewardesses. This is Grade 1, so First year students. Not sure what other classes I will be teaching yet. Also, the weather here is terrible… actually feel like I’m back in Ireland. Cloudy, raining and cold. But I don’t really mind it. I’m used to it back home, and I’ve packed more for cool weather than for hot. Also been reading about Chengdu in the past and I’ve expected bad weather as well. At the moment though, Ireland is going through another heat-wave which I’m missing! My hard drive isn’t working. I’m gutted. I literally am gutted. All of my films, tv series and pictures were on that. I even had my CV on it! Me and Charlotte (my roommate) were happy as Larry watching the Walking Dead last night on it, when I needed to charge my laptop. When I plugged it in again, nothing happened. The icon won’t even appear on the Control Panel. I’m more annoyed because we have nothing to do now at night, and apparently my classes don’t start until the week after next. I’m going to be pretty bored! Internet; the internet is pretty crappy here in the apartment. My phone only works when I’m stuck to a window, whereas my laptop won’t even connect. Computer; My charger is being dodgy. I’m sure it’s the battery but I really don’t want my computer to break. It’s vital for lesson planning! These are all technological problems which I’m not surprised about at all. I’m really bad with technology; everything seems to happen with my electronics. Hopefully I will get it all to work. I HOPE. Oh I also found a spider in my room which jumped away… yes actually JUMPED. Not happy with that! And I have a cold to top it off!